By Jutta Puchhammer-Sedillot; Elise Desjardins. By Heinrich Arends; Henri Busser; Eugene Cools; George Enescu; Leon Firket; Helene Fleury-Roy; Philippe Gaubert; Stan Golestan; Gabriel Grovlez; Leon Honnore; Georges Hue; Rene Jullien; Charles-Edouard Lefebvre; Henri Marteau; Paul Rougnon; Hans Sitt. Classical. CD (2 discs). Published by Navona Records (NX.NV6065). Violist Jutta Puchhammer's album Pieces de concours pour is a treasure trove of late romantic French viola music. Originating as exam compositions for students enrolled at the Conservatoire Superieur de Paris from 1896-1938, this album demonstrates Puchhammer's peerless virtuosity as a performer, as well as the expressive range of her instrument, which was largely dismissed by the mainstream of eighteenth and nineteenth century composers. 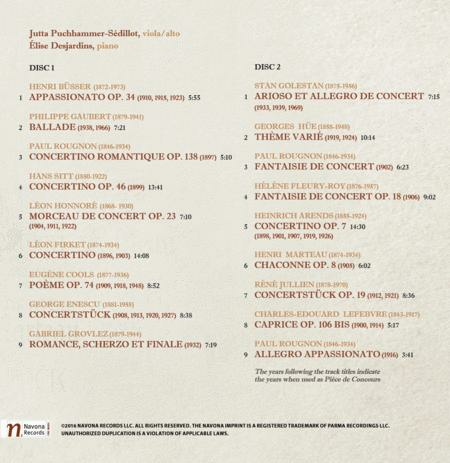 Many of the compositions on Pieces de concours pour share the Classical form of Sitt's concerto, such as Henri Marteau's Chaconne in ut majeur, or the French romantic aesthetic of Busser's Appassionato, such as Paul Rougnon's Concertino Romantique. Romanian-born composer Stan Golestan's Arioso et Allegro marks an interesting departure from these other works, as it reflects the new aesthetics of the twentieth century. Arioso et Allegro is dominated by pentatonic scales, which may suggest the influence of indigenous Asian musics - as they do in Debussy's piano piece Pagodes - Eastern European folk music, or American jazz, which took France by storm in the 1920s and 30s.